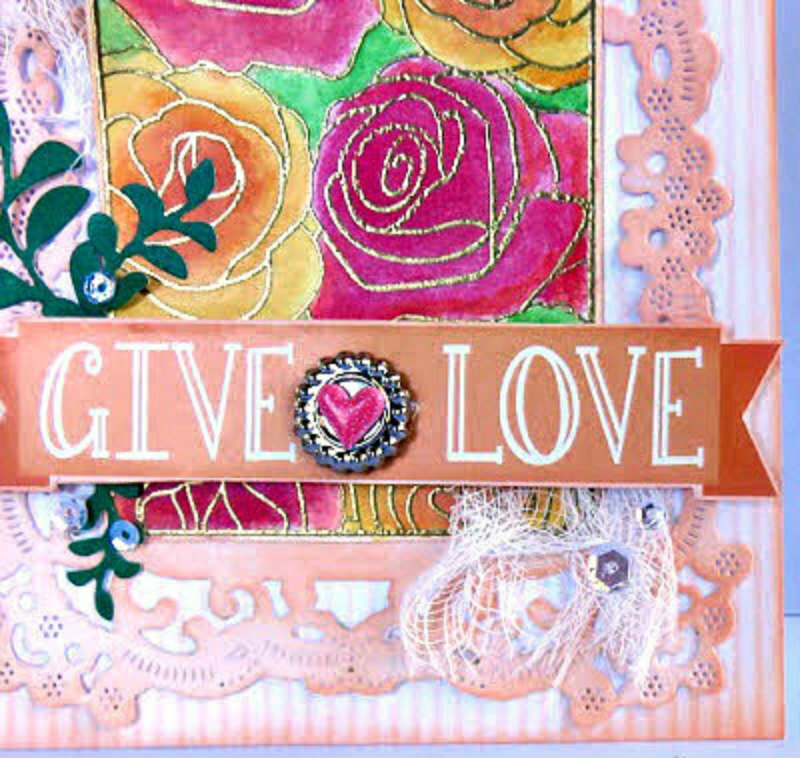 Blog Quick Quotes: Romantic Card with June! Hello and welcome Quick Quotes fans! June here today to host the blog. 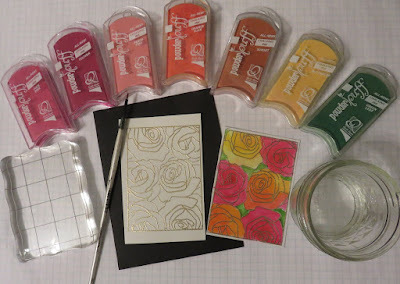 Continuing my love affair with PowderPuff Chalking Inks, I brought out the warm colors of Fuchsia, Rose Petal, Orange Slice, Buttercup, Sunset and Leaf Green. I started out by stamping watercolor paper with some Versamark and a rose stamp. I then heat embossed the design with gold embossing powder. 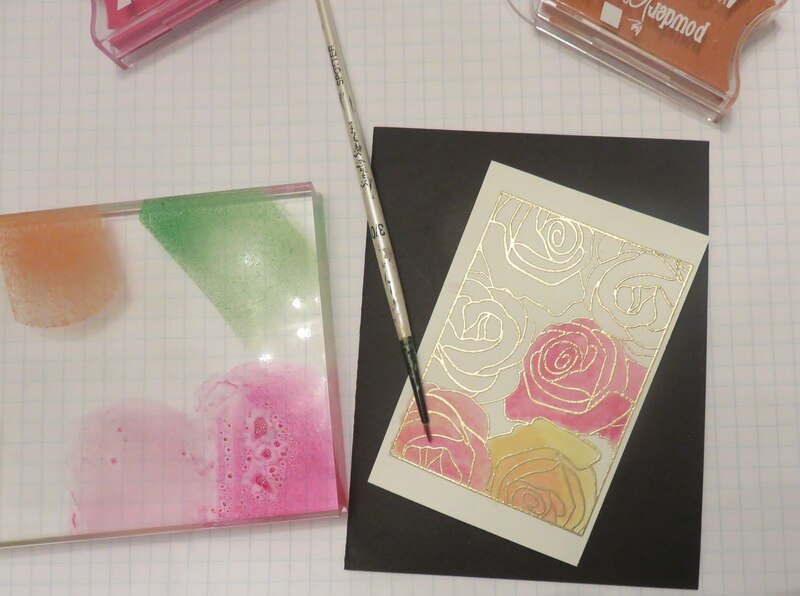 Next, I smeared all the PowderPuff Chalk Inks on an acrylic block and with a little water on a brush, I dipped it into the inks and started painting the flowers. Add several layers of layers of ink on top of each other, letting each layer dry in between. This will intensify your colors and add depth. The pretty frame was cut from Quick Quotes Windsong 100 with a frame die, then matted on Windsong 101. 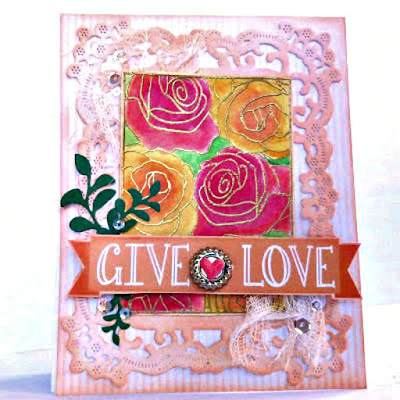 All the paper edges were chalked with Peach Tree and Rose Petal PowderPuff Chalk Inks. The banner sentiment was fussy cut from the Adventure Awaits Strip 600 and popped up with 3L Foam Squares. To finish off this card, I added a fun metal brad, puffy heart sticker, cheese cloth, clear sequins and leaf die cuts. It is always nice to have extra romantic cards on hand for wedding or anniversaries. Be sure to stop on over to Quick Quotes Online Store and check out the brand new 2017 PowderPuff Chalk Inks and the lovely new Windsong collection today!